Three people have been killed and several are seriously injured after cars collided with spectators in two incidents at the Jim Clark Rally in the Scottish Borders, police have said. The most serious incident took place at about 16:00 BST on Saturday when a car taking part in the motor racing event came off the road near Coldstream. Two men and a woman died. Another man is in hospital in a critical condition. A collision two hours earlier left five people injured, one of them seriously. Organisers of the event - the only closed road rally on mainland UK - said they were "devastated" and were working with police to "establish the facts". Police Scotland said the rally was cancelled with immediate effect after the second incident, and that investigations into both collisions were "ongoing". One eyewitness of the second incident, Tony Cowan, told the BBC how the car "lost control". "It went sideways one way and then to the other side of the road and ploughed into four people. "It was terrible, absolutely terrible. I ran to help but there was little I could do. The air ambulance arrived after about three quarters of an hour. There were police cars and ambulances. It was chaos, just chaos," he said. Another eyewitness wrote on Facebook: "Huge accident at rally. Not far from us. About 15 emergency vehicles here now and about 40 people stood working on the injured. Not good." Race marshal Anne Reay said it was the "worst outcome you could have asked for". Laura Bicker, BBC Scotland correspondent, said several witnesses had since contacted the BBC to say they were concerned about spectators standing in dangerous areas along the rally route. "Clearly that is something the organisers will be looking at and something the police will be investigating as part of their inquiries," she said. Supt Phil O'Kane, from Police Scotland, said four men and one woman were injured in the first crash - which happened at 14:05 BST - after a vehicle came off the road near Eccles. He said one man remained in intensive care at Edinburgh Royal Infirmary, while two men suffered fractures and were being treated at Borders General Hospital. The two other patients have been discharged. 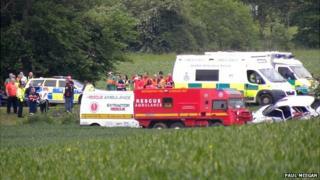 Supt O'Kane said the second crash happened at 16:07 BST. Three people were pronounced dead at the scene, while another man was taken to Edinburgh Royal Infirmary in a critical condition. Supt O'Kane said the force was co-ordinating a "multi-agency" investigation into both incidents. A statement on the Jim Clark Rally website extended organisers' "heartfelt condolences and sympathy" to all those affected by the "tragic events". A statement added: "Berwick and District Motor Club, Border Ecosse Car Club and the governing body, the Motor Sports Association (MSA), are co-operating fully with the police investigation,"
"As with any serious incident on a motor sport event, the MSA will conduct its own thorough inquiry once the police investigation is concluded." Media captionThe BBC's Laura Bicker: "The car is said to have lost control"
Scotland's First Minister Alex Salmond called the tragedy "desperately sad and difficult news". He added: "The Jim Clark Rally is a long-standing event of over 40 years. It is much loved in the Borders and by the rally driving community who I know will share in our sadness at what is a black day for the Borders and for Scotland." Local MSP John Lamont said his "thoughts and prayers are with the victims and their families". "I know the rally organisers place considerable emphasis on the safety of the spectators and drivers but, with any event of this nature, there will always be an element of risk," he said. Mr Lamont said it was "appropriate that questions are asked and investigations are carried out to ensure that in the future nothing like this happens again". The annual rally takes place over three days on closed roads in the Duns and Kelso areas of the Borders, attracting thousands of people from across the UK. It is held in honour of Scottish former Formula 1 champion Jim Clark, who died in a 1968 motor racing accident in Germany.